My hunt for the truth behind Gatorgate. While he was skinny dipping in the Potomac, female reporter Anne Royall sat on his clothes until he agreed to grant her an interview. He kept a pet alligator in the White House, a gift from the Marquis de Lafayette, and he loved terrifying his guests with it. All three, it seems, are bogus. I’ve written about how the skinny dipping interview story was made up to further smear Anne Royall’s reputation, and Quote Investigator nicely debunked the out of character “if your actions inspire others” quote and attributed it to its real source: Dolly Parton. Now let’s dive into this alligator tale. The story of this pet alligator is pervasive, and utterly shareable. Its specificity (the East Room!) makes it seem so believable. It pops up in countless trivia books and it’s even on a Snapple cap. I asked Snapple for their source and they responded: “I do apologize, but we can’t reveal our sources — I mean, we’d hate for them to stop supplying Real Facts ;)” Well I got news for you, Snapple: Your source is giving you bad intel and your peach tea is amazing. Beyond tweets and articles, this story has developed into its own cottage industry. Did you know you can actually buy a plush John Quincy Adams alligator? Just look at him. John Quincy Adams can’t even. This is clearly a fun story, and it’s a story I really wanted to be true. But when I went digging for the source, all I found were holes. Most modern sources, including Mental Floss cite the Presidential Pet Museum as their source. I had hopes someone from the museum could point me toward their sources. That made total sense to me, as Wikipedia is a great jumping-off point for research. So I went to Wikipedia’s page on presidential pets and saw Adams’s alligator listed there. Then I checked the citation. It was the Presidential Pet Museum. At this point I started to wonder if Melissa was screwing with me. We don’t need to find the source; we have become it. But I knew they didn’t just make this story up—there are plenty of mentions of it in print long before the pet museum’s 1999 founding. The legend is retold in 1958’s The White House and Its Thirty-Two Families by Amy La Follette Jensen and in 1975’s Dog Days at the White House: The Outrageous Memoirs of the Presidential Kennel Keeper by Traphes Bryant, among others. What’s more notable than where the story is mentioned, though, is where the story is not mentioned. In fact, there don’t seem to be any primary sources for the story. The earliest mention of it I could find of an alligator in Adams’s White House comes from from 1888, sixty-three years after it supposedly happened. That is the extent of Upton’s alligator story – just a nonchalant mention of multiple alligators chilling in the East Room like it was perfectly normal. This version increases the number of gators but significantly lessens the drama. Here these little critters are just deposited among other things; they’re certainly not scaring the hell out of a mischievous president’s unwitting guests. To get the best possible historical insight into the matter, I reached out to some experts to see if they were aware of any earlier mentions of the story than this. I doubt that renowned suffragist Harriet Taylor Upton made up the story. So where did she get it? We may never know. But the timespan from when it would have happened to when she wrote about it and the utter lack of corroborating accounts are too much to ignore. But then he brought up a great point: “How likely is the anecdote to be true? It’s hard to say. Keeping an alligator in a tub for a few months certainly isn’t difficult. Especially since the alligator (if it existed) was a juvenile.” He’s right. I’ve seen baby alligators, and they’re easily transported and stored. There could be one chilling in your toilet bowl right now and you might not know it. Harmless baby specimens, however, are not what makes this story endearing. 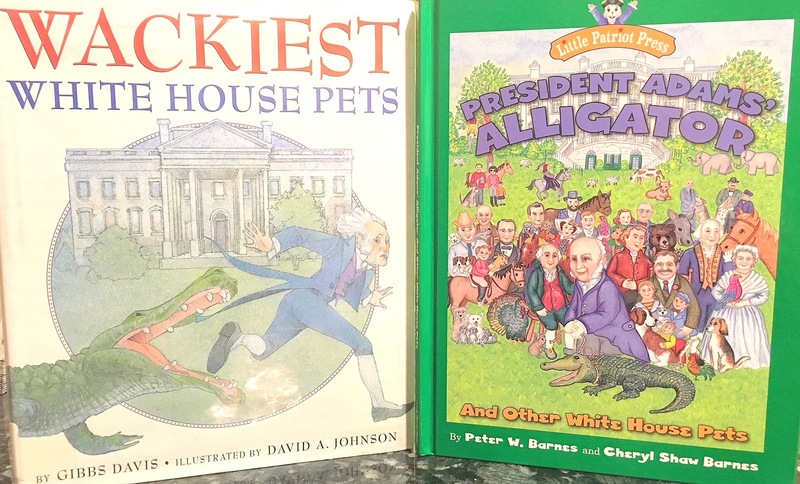 It’s more fun to imagine a full-grown alligator chomping at the heels of guests, or even the president himself like on the cover of Wackiest White House Pets. The story demands equal parts danger and hilarity. Its earliest instance in print suggests neither. Whatever happened at John Quincy Adams’s White House, we’re pretty sure this wasn’t it. So is it possible that a wee baby alligator was stored in John Quincy Adams’s White House for a while? It’s not impossible. Is it possible that such a fun fact would have been kept completely off the contemporary press’s radar? Considering that we only have one diary entry as the source of the White House’s deadliest animal (one of Thomas Jefferson’s sheep that killed a boy on the White House lawn) it’s possible. The good news is that unlike the apocryphal skinny dipping interview story, this alligator tale doesn’t really hurt anybody. I honestly wish it were true. But for me, the fact that the experts call it a myth means it’s time to retire the harmless fun. There are enough truly weird things about John Quincy Adams and the White House that there is no need to perpetuate false ones. The Presidential Pet Museum also published an article called “Bitten By An Alligator” acknowledging my research here and conceding the story is “probably not true.” They even went so far as to apologize for spreading the tall tale! After reaching out again, I still have not heard back from Snapple though I continue to enjoy their fine beverages. As a Wikipedia editor attempting to research The Real Story regarding the “alligator in the East Room”, I discovered your article — an interesting example of “circular sourcing”. There are a few revisions in order Btw, I’m currently going through the Presidential Pets article, and have removed a few dubious entries and will modify this ‘alligator. one (more to come?). That’s great to hear! Now we just have to infiltrate Snapple.